Global automotive plastics market size is projected to surpass USD 50 billion by 2024 due to its growing applications in power trains, interior & exterior furnishings, electrical components, and under the hood chassis. Improvement in automobile design based on aesthetic design parameters, strict emission control norms and growing significance of weight reduction to reduce fuel consumption in vehicles are predicted to boost the demand for automotive plastics over the coming years. With innovations in vehicle component manufacturing technology, thermoplastic elastomers coupled with high-performance plastics are finding growing applications in automobile industry. 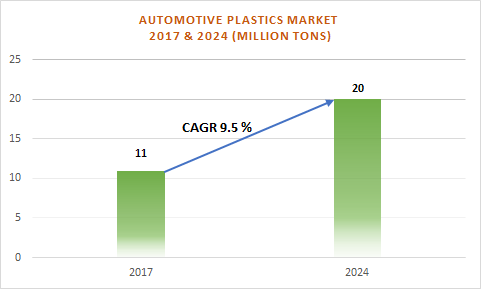 Automotive plastics industry size estimated at 11 million tons in 2017, is predicted to surpass 20 million tons by 2024, growing at a CAGR of around 9.5% over the period of 2018-2024. Automotive plastics provide significant reduction in the weight of the vehicle resulting in fuel efficiency and reduction in greenhouse emissions. Growing investments in bioplastics production for automobile applications is predicted to support the market growth. However, non-biodegradable property of synthetic polymers along with growing ecological concerns related to carbon emissions from conventional polymers are anticipated to inhibit the market growth over the coming years. Automotive plastics market is segmented in terms of applications, products, and regions. Applications segment includes power train, interior & exterior furnishings, electrical components, and under the hood chassis applications. Interior & exterior furnishings application segment, which contributed about 33% of the overall demand in 2017, is predicted to grow at a rate of around 9.5% over the forecast timeframe. Bumper systems, fascia systems, body & light panels, and steering wheels are key parts utilizing automotive plastics. Electrical components application, which dominated the application segment in 2017 by contributing over USD 8.5 billion, is anticipated to witness a substantial growth over the forecast timeline. Corrosion resistance and lightweight properties of automotive plastics make them an ideal metal substitute in the application. Furthermore, sockets manufactured from high performance plastics can sustain high temperature without getting degraded. Power trains application segment is predicted to witness a noticeable growth over the forecast timeframe owing to the growing use of automotive plastics for producing internal transmission parts and jolt bolts. Product segment comprises polyurethane, polypropylene, PVC, polyamide, polyethylene, ABS, polycarbonate, and PMMA (Polymethyl methacrylate) products. Polyurethane automotive plastics market, which contributed over 19% of the overall volume in 2014, is predicted to grow at a rate of around 10% over the forecast timeframe. PU foam provides the automobile manufacturers & designers with the means to manufacture lightweight seats that can also be recycled, assembled, and disassembled. Reaction injection-molded PU components are extensively used in the transportation industry. Polymethyl methacrylate automotive plastics market is expected to witness a significant growth over the forecast timeframe as a result of its growing use in sidelights. Polypropylene automotive plastics market worth over USD 7 billion in 2017, is projected to witness a substantial surge over the forecast period owing to its wide use as steel substitutes for achieving desired weight and cost reductions. MEA automotive plastics market is predicted to witness a noticeable growth over the forecast timeline owing to increase in sales of automobiles in the region. UAE and Saudi Arabia are predicted to make a significant contribution towards the regional growth. Asia Pacific automotive plastics market worth over USD 13 billion in 2017, is predicted to witness a significant growth over the forecast timeframe owing to shift in automobile production units to countries like Thailand, China, Indonesia, and India as a result of cheap labor costs along with government support. Central & South America automotive plastics market is projected to witness a substantial growth over the forecast timeline due to increase in consumer expenditure along with the rise in sales of automobiles. Key industry players include BASF, Delphi Automotive, The Dow Chemical Company, Johnson Controls, AkzoNobel N.V., Delphi Automotive, Lear Corporation, and Evonik Industries.